Three has announced a £117 ($150) per month contract for the iPhone X. It's been described as "extreme" and "crazy" on social media. The two-year deal, which includes unlimited data and talk time, is for the largest version of the device. The same contract with an iPhone 8 costs £44 per month, plus a £99 upfront fee. The handset is sold by Apple for £1,149 but under Three's deal customers could end up paying more than £2,100, based on its current sim-only charges. Three's current all-inclusive sim-only deal is £29 per month. The firm said it had various tariffs to suit different customers. "There are a small amount of people that prefer not to pay an upfront cost yet want access to all-you-can eat data, minutes and texts and this is aimed at them," Three told BBC. There are cheaper alternatives, it added. "If that was an electrical retailer's 'interest rate' there'd be outrage," tweeted Michael Firth. "No phone is worth over £30 [per month] in my opinion," tweeted The Cyber Heartbeat. Other operators are offering the device on a monthly contract ranging between £80 and £88 but are also often charging an additional upfront payment. O2 is charging £86 per month plus a one-off £119.99 for a similar deal with 50GB data on the larger phone. Vodafone does not offer unlimited data either but its most expensive tariff is £80 per month plus a £100 charge for 60GB per month of data. The phone is currently available to pre-order only. 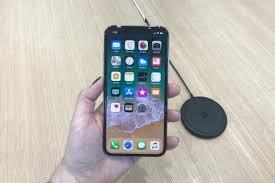 Apple's pricing for the iPhone X had already shifted smartphone price barriers, said analyst Kester Mann from CCS Insight. "However, Three's bold move to break through the psychological £100 per month barrier is a huge ask even for its most dedicated and loyal fans," he added. Technology journalist Kate Bevan said it is generally cheaper to buy a handset upfront rather than as part of a contract deal. "I'm sure the iPhone X will be a very good phone," she said. "However, if I were going to buy one - which I'm not - I would hold off until the new year if possible, to give Apple a chance to iron out any wrinkles with it and to see if prices from mobile providers come down a bit."